You will learn all about one of the most exciting, mysterious and sacred trees in the world and the gorgeous Madrone wood hidden inside. You will find here a wide range of wood craft gifts that showcase its secrets and inner beauty. 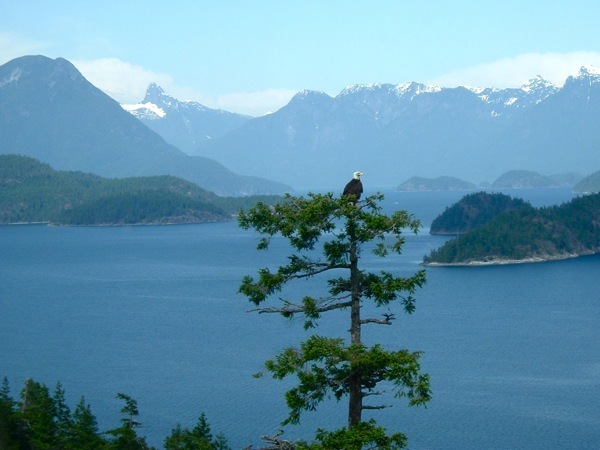 And you will thrill to see the amazing habitat and blessings of visiting this part of the BC Gulf Islands. We have great gifts for women and unique men's gifts (some say unusual men's gifts!...check out our dagger letter openers). Left handedness is often a barrier for buying gifts --- we specialize in many left handed gifts. Are you looking for unique wedding gift ideas? You'll find them here! Wood carved art, rustic wood crafts, exotic wood sculptures ... all are unique homemade wood crafts with a flare for style and functionality. 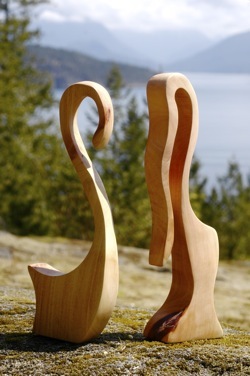 If you are looking for very special wood wedding gifts or wood craft gifts, then Arbutus Arts is the place for you. If you want unique gifts for women, then read on! If you love wood products, then these wood carvings made from the Arbutus tree will delight you as it has many thousands already! You can be sure you can find a rare and special gift that will be treasured for years and years. 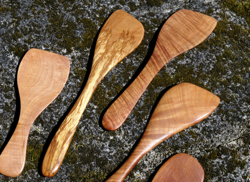 Our Arbutus Arts Culinary Collection features spectacular wood polished to 3000 grit for exquisite beauty. Form and function meet in these treasures. Professional chefs and home cooking lovers will delight in our special and unique designs...made for both function and hand comfort. Our pieces quickly become the favorite utensil! Do you love cooking? Our hand crafted special designs will delight you with their superior performance. There is nothing better than wood as the finest material for cooking and serving your food! 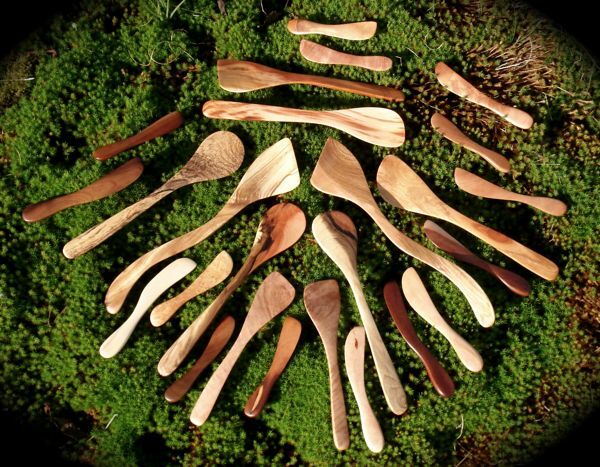 Used throughout the ages, wood has proven to be the perfect cooking and serving utensil. Still today, wood wins for its beauty and functionality. It sure beats plastic for its non-scratch performance! 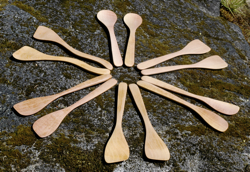 Wood, non-scratch serving utensils are also ideal non-stick utensils when kept well oiled with a food safe wood finish. Have you got fine dinnerware? Then you need the best servers for those culinary delights. Our wood servers and salad sets will make your bowls and serveware stand out with the glory of fine wood. 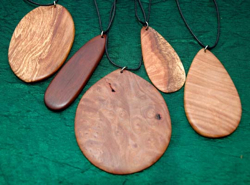 We save the very rarest Arbutus wood selections for our wooden sculpture, jewelry, earrings, pendants and keychains. Make a unique fashion statement from this wood's natural beauty. Each piece of this Arbutus wood (or Madrone wood) is exceptionally gorgeous. And each piece is a one of a kind handcrafted gem. Be sure to check out our West Coast Whale Knife, made in the shape of a whale to honor our killer whale friends, also known as Orca Whales, that the Arbutus Tree watches down from its heights on the bluffs overlooking the sea. Do you want a special gift that will remind you every day of BC's famous west coast? Then this is for you! Made from Arbutus hardwood, these knives are great for buttering your toast, spreading soft cheese and pate or adding jam! And for nut butters, there is no better spreader! Be creative. Add a wood cheese spreader to wine and cheese baskets or corporate Christmas gift baskets for an exceptional gift. Made from forest fall downs and dead branches and trees, and from salvaged sources, you can be proud that your gifts come from the most sustainable forestry practices. We do not cut down live trees for our wood...the best wood grain colors comes from dead wood that has changed color after dying on the tree. That's why we can say all our woodcraft gifts are made from eco friendly wood. BC or British Columbia's Gulf Islands are home to the rare Arbutus Tree and its cousin the Manzanita tree. These wood crafts have thrilled thousands here on BC's West Coast Gulf Islands and now at last we can bring to the world our fine wood art through this site. So enjoy your stay and learn all about the Arbutus Tree (Madrone Tree), Arbutus Wood and of course BC's Gulf Islands and our own Gulf Island, Cortes Island, at the entrance to Desolation Sound. Discover why boaters and kayakers from around the world come to these waters. See Canada's Matterhorn - our Mount Denman - which hovers majestically over the fjords and inlets and islets of these protected waterways. It is not just the Arbutus Tree (or Madrona Tree) that enjoys the splendid views! 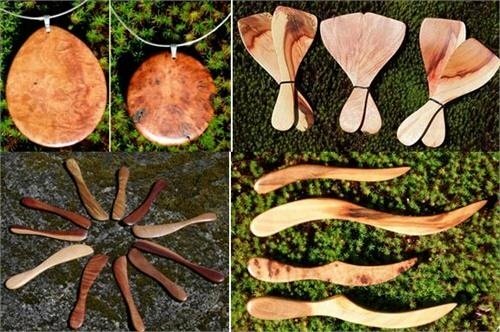 These handmade wooden earrings from sacred Arbutus tree wood are unique earrings: one of a kind that no one else in the world will have but you! Find your left handedness solutions for the kitchen here! Left handedness problems solved here for left handed people with fabulous products for the kitchen and fine dining! Magnificent, dramatic, exciting, mystical, inspiring, magical, sensual ... these are some of the words people use to describe their favorite tree, the Madrone Tree of the Pacific Northwest. 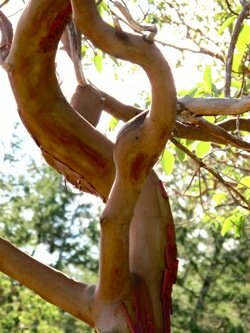 While many think the Manzanita tree is the same as a Madrone tree, it is actually a bush! If you love the Arbutus Tree or if it is one of your favorite trees, then check out these tree poems! Arbutus flower Oh so sweet .... You perfume the air, Oh what a treat! Arbutus flower Oh so sweet .... You perfume the air, Oh what a treat! Arbutus flower, you have scent divine! Why is Madrone Wood also known as Arbutus Wood one of the best exotic hardwoods in the world? 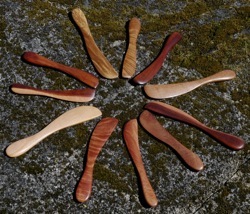 Madrone Wood: The Most Exotic Hardwood in the World? 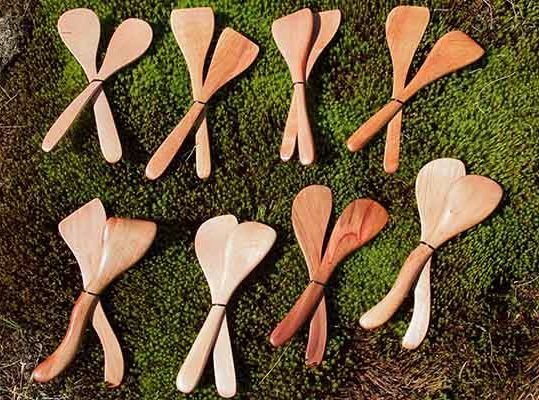 When I first started carving wooden spoons, you would have to say I was making very primitive wood crafts! Gulf Islands British Columbia: My Favorite Islands! Cortes Island: My Favorite British Columbia Gulf Island...no wonder it is such an island paradise! The Arbutus Arts Blog keeps you up-to-date with all additions and changes to the ArbutusArts.com website. Subscribe here. Questions and Answers about Arbutus or Madrone trees and wood, and Manzanita! Your Questions and Answers about Arbutus or Madrone trees and wood, and Manzanita and Yew too!